Finding Your Latititude From The Midday Sun. 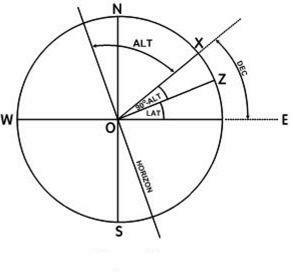 The following diagrams will help to explain how the latitude can be calculated from the Sun’s midday altitude and its declination. Now consider the next diagram. Imagine the Earth to be at the centre of the imaginary celestial sphere with the positions Z and X projected onto the surface of that sphere. NOS represents the projection of a line joining the North and South poles onto the surface of the sphere. Therefore, Lat. 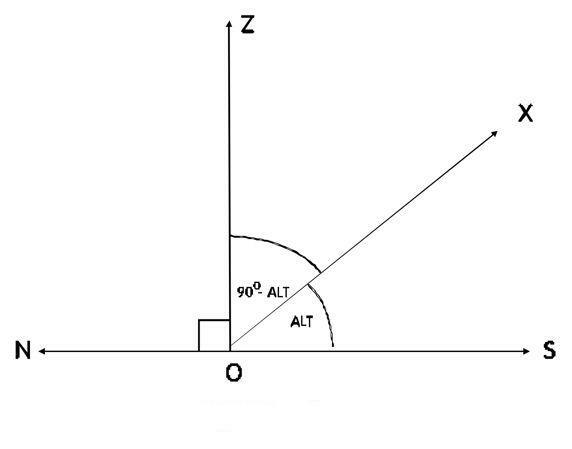 = Declination + (90o-Altitude). 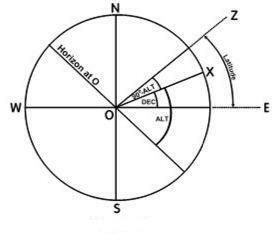 In the next diagram, latitude and declination are in the same hemisphere but declination is greater than latitude. therefore, Lat. = (90o – Alt.) – Dec.
= 9o 11’.99 – 2o 59’.0 = 6 o 12’.9N. 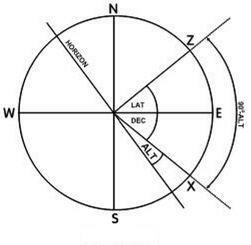 This entry was posted in Astro Navigation Topics, Schools and tagged astro navigation, celestial navigation, navigation, survival. Bookmark the permalink.